Wahama senior Tanner Smith (7) follows his blocking during a first quarter run on Monday night in a Week 5 TVC Hocking football contest against Federal Hocking in Stewart, Ohio. Wahama senior Ronin Madill (9) runs with the ball during the first half of Monday night’s Week 5 TVC Hocking football contest against Federal Hocking in Stewart, Ohio. STEWART, Ohio — The White Falcons provided the lightning this time around … and not even Mother Nature could rain on their parade. 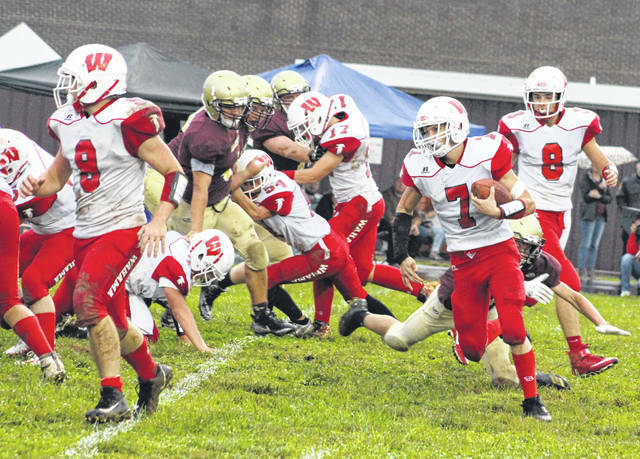 The Wahama football team scored on its first four possessions, forced a running clock for all but eight seconds of the second half and also handed first-year coach James Toth his first win on Monday night during a convincing 50-22 victory over host Federal Hocking in a rain-soaked Week 5 Tri-Valley Conference Hocking Division contest at Lester and Betty Green Field in Athens County. 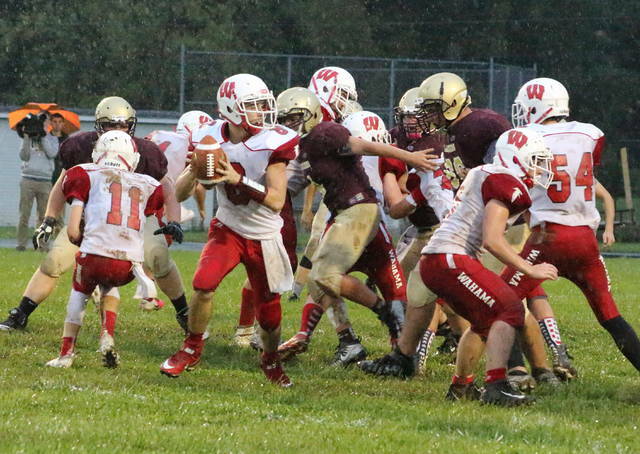 In a game that was postponed Friday night due to lightning, the White Falcons (1-4, 1-3 TVC Hocking) wasted little time in taking control of a battle between winless teams. The Red and White had five different players score points in the opening half alone, which led to a sizable 38-6 advantage headed into the break. The Lancers (0-4, 0-3) — who have now dropped 35 straight decisions, dating back to a 16-14 win over Waterford in Week 9 of the 2014 campaign — trailed 44-6 headed into the finale, but the Maroon and Gold put together a pair of scoring drives down the stretch to close the gap down to 28 points with eight seconds left in regulation. It was the only time after the intermission that the clock wasn’t continuously running, which ultimately proved to be the only victory that the hosts could enjoy on this night. First-year WHS head coach James Toth — who was an assistant on numerous Wahama teams until the 2010 campaign — was a bit emotional after picking up his first victory on the White Falcon sidelines in roughly eight years. After all, knowing where this program was two months ago when he accepted the job — the proud mentor couldn’t help but be proud of his troops and what they had just accomplished. “You have to understand that we started in July with 13 guys, but the school and the community rallied around this program because it is proud of what it has done on the football field,” Toth said. “Despite starting out with four losses, we didn’t have any kids quit … but instead we had more kids come out and try to help this team put together some wins. Right now, I couldn’t be any happier for these kids simply because they’ve continued to work hard … and now they have something to celebrate. Ronin Madill gave the guests a permanent lead less than four minutes into regulation as his nine-yard run — combined with a successful Tanner Smith two-point conversion run — gave Wahama an 8-0 edge with 8:50 remaining. The White Falcons increased their lead to 14 points at the 3:30 mark of the first as Brady Bumgarner rumbled into the end zone from three yards out. Abrahm Pauley scored on a one-yard run at the 10:56 mark of the second canto, then Smith added a successful two-point conversion run to secure a 22-0 advantage. Bumgarner added his second and final TD run on an 18-yard scamper with 8:51 remaining. Brayden Davenport converted the two-point conversion run, giving WHS a commanding 30-0 cushion. The Lancers finally broke into the scoring column with 1:22 remaining until halftime as Hunter Smith rumbled 13 yards to pay dirt, cutting the deficit down to 30-6. Wahama, however, needed less than a minute to go the length of the field as Smith hauled in a 15-yard touchdown pass from Pauley with 38 seconds left. Pauley then added the two-point conversion run, giving the White Falcons a comfortable 38-6 cushion headed into the break. With Ohio’s continuous clock rule when the lead is 30 or more points in the second half, time was clearly on Wahama’s side after the intermission. After forcing a stop on Fed Hock’s opening possession of the third, the Red and White followed with a scoring drive that ended on a Pauley nine-yard scamper at the 5:48 mark of the third — making it a 44-6 contest headed into the fourth. Smith whittled the hosts’ deficit down on a six-yard TD run with 11:09 remaining in regulation, then tacked on a successful two-point conversion for a 44-14 contest. The White Falcons, however, produced their final score of the night on a Jacob Fisher one-yard run at the 4:54 mark, making it a 50-14 game. Smith tacked on the final TD with a 36-yard jaunt with eight seconds left, then Ethan McCune added a successful two-point run to wrap up the 28-point difference. Wahama outgained the hosts by a sizable 397-207 margin in total yards of offense, which included a 332-161 edge in rushing yards. WHS claimed a 20-11 advantage in first downs and was also plus-1 in turnover differential. Bumgarner led the White Falcon rushing attack with 88 yards on 11 carries, followed by Smith with 70 yards on seven totes. Madill also chipped in 65 yards on 10 attempts. Pauley completed 3-of-5 passes for 65 yards and a score. Pauley also rushed for 57 yards on five tries. Davenport led the wideouts with one catch for 28 yards. Jacob Warth had one grab for 22 yards, while Smith hauled in one pass for 15 yards. The guests were penalized eight times for 90 yards, while Fed Hock was flagged twice for 20 yards. Donnie McCain paced Federal Hocking with 61 yards on nine attempts, followed by Smith with 59 yards on seven tries. Smith was also 5-of-15 passing for 46 yards. Seth Koon led the FHHS receivers with two catches for 32 yards. 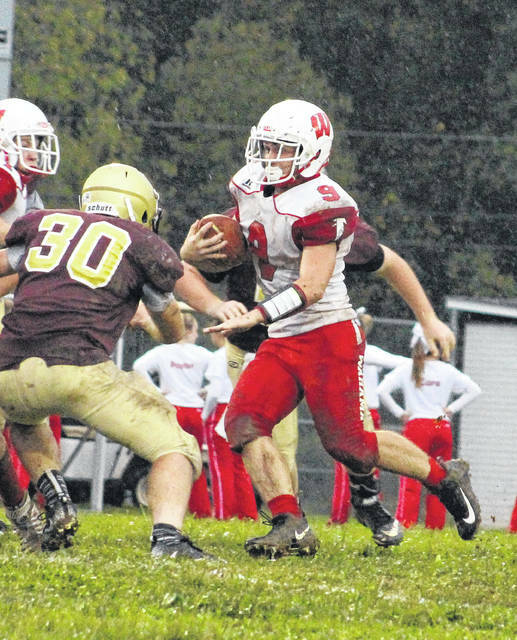 Wahama returns to TVC Hocking action Friday when it hosts Eastern in a Week 6 contest at Bachtel Stadium at 7:30 p.m.